Kathy Sdao is an associate Certified Applied Animal Behaviorist based in Tacoma, Washington and has spent the past two decades as a full-time professional trainer for dogs and other animals. For her first ten years as an animal trainer, Kathy trained marine mammals at a research laboratory for the University of Hawaii, in the open-ocean for the US Navy and at a zoo in Tacoma Washington. 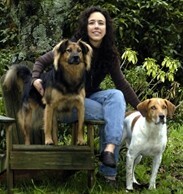 Since 1995, Kathy has focused on training land-dwelling animals: dogs and their people. Kathy meets with dog owners in Tacoma, Seattle, and other areas in the Puget Sound region to design behavior modification plans, to teach basic manners to their dogs and to prepare for competition. She also travels extensively to lead dog training and behavior workshops that make the science of animal training accessible and practical for dog trainers and owners alike.